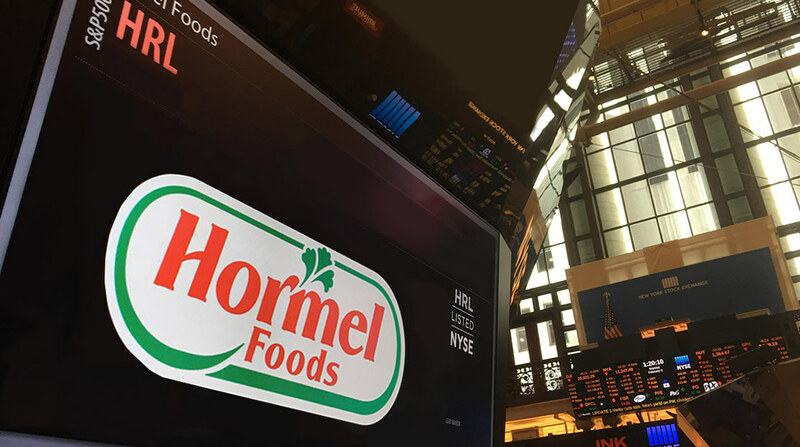 Hormel Foods Corporation (NYSE: HRL) today reported its performance for the fiscal 2008 first quarter. The company reported fiscal 2008 first quarter net earnings of $88.2 million, up 17 percent from earnings of $75.3 million a year earlier. Diluted earnings per share for the quarter were $.64 this year compared to $.54 per share last year. Sales totaled $1.62 billion, up from $1.50 billion in fiscal 2007. The Grocery Products segment had a great start to the year with segment profit up 10 percent compared to last year. Continued growth of the HORMEL COMPLEATS microwave product line was a key driver during the quarter. Strong sales of the SPAM family of products and HORMEL and STAGG chili also contributed to top and bottom line results for the segment. Results for the CHI-CHI’S and VALLEY FRESH product lines were down for the quarter compared to last year but additional marketing and promotional support is planned to drive improved results for these brands. Operating profit increased 50 percent in the Refrigerated Foods segment compared to the first quarter last year. Lower pork raw material input costs led to significant margin expansion across the segment’s value-added businesses. Sales of key value-added products also increased during the quarter. The Meat Products business unit recorded double-digit sales increases in HORMELrefrigerated entrees and HORMEL NATURAL CHOICE sandwich meats. The integration of Burke Corporation continues to proceed as planned and was accretive to the first quarter results. The Jennie-O Turkey Store segment posted operating profit results 16 percent higher than last year for the first quarter. The segment was able to overcome higher commodity grain input costs through a combination of higher pricing, product mix improvements, and manufacturing efficiencies. Value-added revenue grew 5 percent with each of the retail, deli, and foodservice divisions contributing to the increase. Key products posting strong first quarter results includeJENNIE-O TURKEY STORE frozen turkey burgers, JENNIE-O TURKEY STORE marinated tenderloins, and JENNIE-O TURKEY STORE rotisserie deli products. Operating profit in the Specialty Foods segment increased 1 percent compared to the first quarter of fiscal 2007. Sales and operating profit were higher for the quarter in the Specialty Products business unit behind strong demand for contract manufacturing. Century Foods International also posted improved profit results due to a favorable product mix shift. Operating profit was slightly lower in the Diamond Crystal Brands business unit as a better product mix was unable to completely offset higher input costs. The International business unit had another strong quarter with operating profit up 39 percent compared to last year. Strong export sales of the SPAM family of products, STAGG chili, and fresh pork were key drivers during the quarter. The profitability of our China operations also improved compared to last year as a result of higher selling prices and a continued emphasis on growing value-added sales. Equity in earnings of affiliates improved compared to last year due to better results at our Purefoods-Hormel joint venture in the Philippines. Net interest and investment income declined for the quarter due primarily to $6.3 million of lower returns on our rabbi trust investment. Interest expense was slightly higher for the quarter due to higher outstanding short-term debt balances related to the Burke acquisition. “We are reconfirming our fiscal 2008 guidance range of $2.30-$2.40 per share. Although we anticipate pressure from higher than expected grain and energy costs, we expect to continue to benefit from lower protein input costs. The strength of our core businesses, the growth of our value-added products, and the ability of our people to adapt to changes in the business environment should allow us to meet our goals,” Ettinger concluded. Effective Feb. 15, 2008, the company will pay its 318th consecutive quarterly dividend. The annual rate is $.74. A conference call will be Webcast at 10:00 a.m. CT on Friday, Feb. 15, 2008. Access is available at www.hormelfoods.com. If you do not have Internet access and want to listen to the call over the phone, the dial in number is 800-218-0713. An audio replay is available by calling 800-405-2236 and entering access code 11107655#. The audio replay will be available beginning at 12:00 p.m. CT on Friday, Feb. 15, 2008, through 11:59 p.m. CT on March 1, 2008. The Webcast replay will be available at 12:00 p.m. CT, Friday, Feb. 15, 2008, and archived for one year. Hormel Foods Corporation, based in Austin, Minn., is a multinational manufacturer and marketer of consumer-branded food and meat products, many of which are among the best known and trusted in the food industry. The company leverages its extensive expertise, innovation and high competencies in pork and turkey processing and marketing to bring quality, value-added brands to the global marketplace. For each of the past nine years, Hormel Foods has been named one of “The Best Big Companies in America” by Forbesmagazine. The company enjoys a strong reputation among consumers, retail grocers and foodservice customers for products highly regarded for quality, taste, nutrition, convenience and value. For more information, visit www.hormelfoods.com.